In yesterday’s post, I talked about Venom/Eddie Brock’s warped sense of honor and duty where he valued the lives of “innocents” but only if they cooperated with him in his quest to kill Spider-Man. Since Venom/Brock first debuted in the late 80s, both the alien suit and Brock himself have undergone a number of changes and evolutions, from new alien spawns, new people wearing the suit, to new suits for Brock. 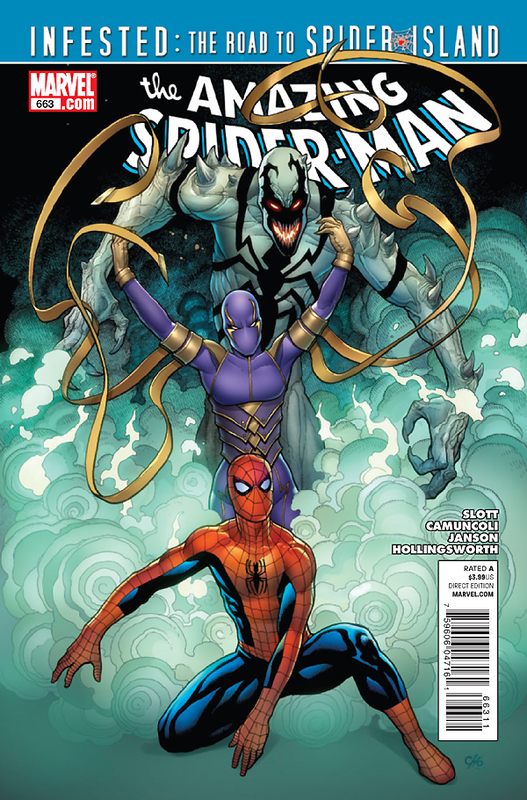 In Amazing Spider-Man #663, the storyline revolves around the latest incarnation of the Venom/Brock saga, which sees Eddie, who has rejected the suit, and has taken the mantel of Anti-Venom. 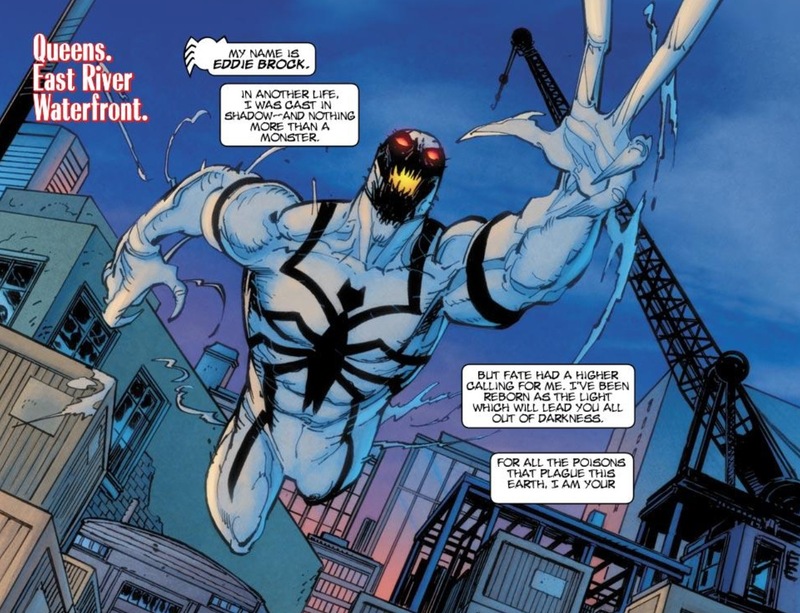 As Anti-Venom, Brock has rejected the symbiote and is even more obsessed with protecting innocents. 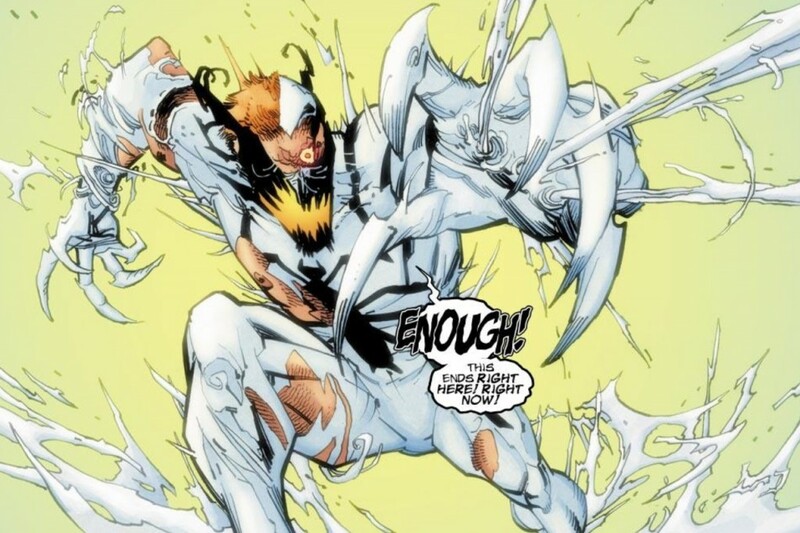 But since his methods of differentiating between innocents and villains is still questionable due to Brock’s noted psychotic nature and mean-streak, Anti-Venom is more of an anti-hero than a true-blooded superhero. Thinking back, Brock has always been a bit of an anti-hero. During the Maximum Carnage storyline in the 1990s, Venom/Brock is able to put aside his rage towards Spider-Man to align himself to take out Carnage, a serial killer who has also been infected with the alien symbiote. Because Carnage kills indiscriminately, Venom’s desire to protect “innocents,” trumps his Spidey hatred. After this storyline, Marvel started expanding the idea of Venom/Brock as a tweener anti-hero, putting him in multiple solo comics and miniseries. But even with Brock occasionally working on the side of good, the tension between him and Spider-Man has always remained. Given that the whole basis of Venom’s origin is centered around Brock blaming Spider-Man for ruining his life, even as the ever-so-slightly-more-virtuous Anti-Venom, it’s difficult to believe his once deep-set hatred would ever be fully washed away. Anti-Venom can never be a true superhero, sheerly because of the character’s backstory and his very unstable, violent nature. But there’s just enough “good” in Brock where he can still be an effective foil to Spider-Man. At this point in the character’s development, the best use of Anti-Venom/Brock is to exploit his tenuous relationship with Spider-Man. Even if Anti-Venom is clearly the right with his actions, Spider-Man shouldn’t trust him due to his long history of violent confrontations with Brock. And ultimately Brock shouldn’t trust Spidey since he doesn’t endorse the extreme methods Anti-Venom preaches to protect innocents. That’s exactly what happens in ASM #663. Brock has turned on philanthropist Martin Li, who is secretly super-villain Mister Negative. 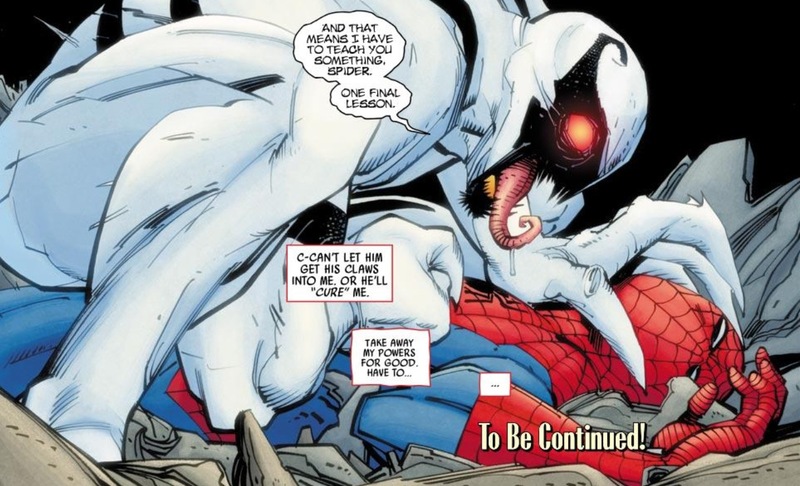 When Brock believes Negative has harmed Peter’s Aunt May, Anti-Venom takes over and attacks Li. 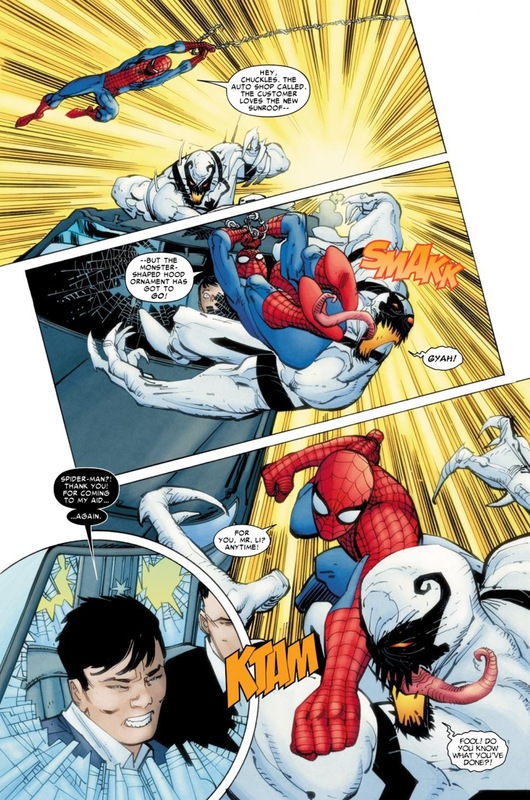 Spider-Man/Peter, unaware of Li’s villainous secret identity, believes Brock has given in to his psychotic demons, leading to a confrontation where Anti-Venom overpowers Spidey and saps him of his superpowers. 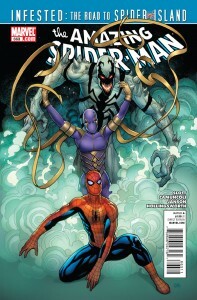 The confrontation sets-up the inevitable alliance between Spidey and Anti-Venom in ASM #664 where it’s sure to resemble the Marvel Universe version of the Randall/Klugman Odd Couple – except in this situation, Oscar might snap and beat the holy crap out of Felix if he believes he is justified. Because Anti-Venom is correct in his assessment that Li is actually a criminal mastermind, Spider-Man is going to have to trust Brock just enough to work with him, even though he’s always capable of going over the deep end and turning on Spidey.